Burying beetles mate by choosing a decaying animal carcass to fornicate next to, then laying their larvae in its rotting flesh. Hot! The male also needs to know that he shouldn’t bother his partner during her infertile period. Searching for a signal, the scientists looked at another chemical called methyl geranate. Female beetles make this while they’re breeding. Unlike a hormone, which stays inside the body to do its work, methyl geranate gets released into the air. 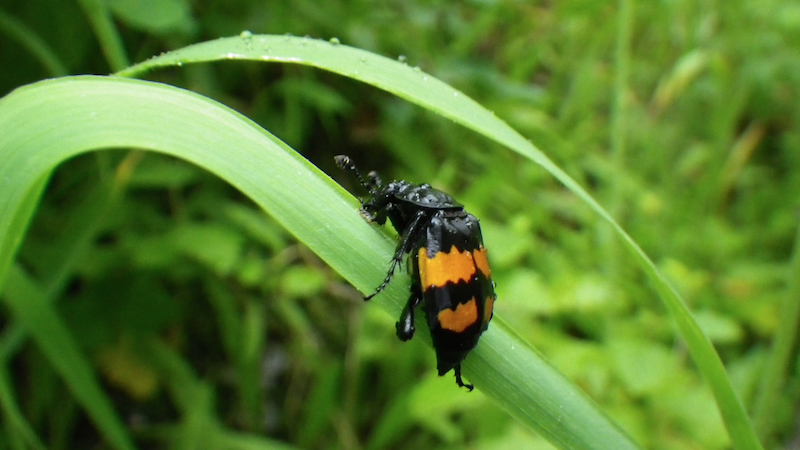 Sure enough, the scientists saw that female burying beetles gave off the most methyl geranate right after their new larvae hatched. The more babies were in her brood, the more of the chemical a mom gave off. And males, they saw, didn’t try to mate with their partners during this time. Researchers say this is the first time an evolutionary trick of this nature has been discovered in the insect world. No word on how it can be synthesized for humans.